Number of rotors 4 pcs. 4 pcs. Number of arms per rotor 6 pcs. 6 pcs. Number of rotors 6 pcs. 6 pcs. 6 pcs. Number of arms per rotor 5 pcs. 6 pcs. 6 pcs. Number of rotors 8 pcs. 8 pcs. Number of arms per rotor 5 pcs. 6 pcs. The angle is adjusted using a lever on each wheel. These tedders offer working widths (DIN) of 4.40 m and 5.20 m, feature a highly compact construction and are ideal for working on slopes. Compact advantage. 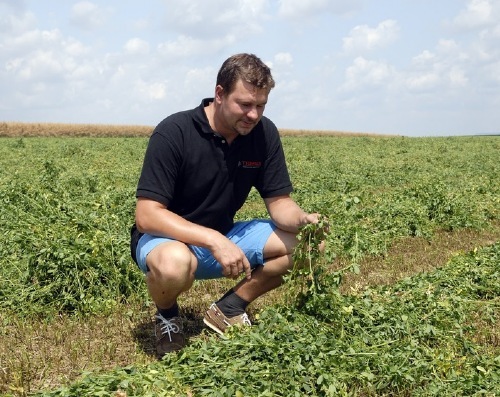 Six tine arms per rotor guarantee an optimum spread pattern for every forage. HIT mounted tedders are known for their short headstock. This brings the centre of gravity closer to the tractor. Less lifting power is needed and driving safety is increased. 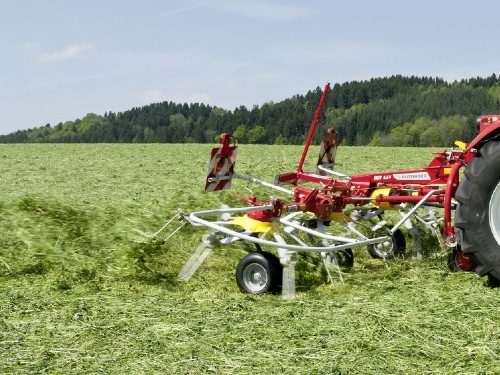 Tedders with pivoting headstocks follow in the tractor's tracks without swivelling out. The pivoting headstock with a heart-shaped pivot pin brings the machine into the centre position when it is raised. A slotted hole is provided for operation with a jockey wheel and rigid top linkage. A practical PTO shaft holder makes hitching and unhitching a great deal easier. The transport interlock enhances safety on the road. 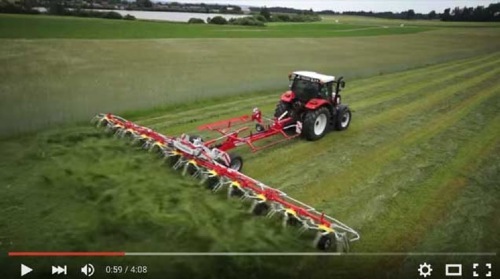 The hydraulic rotor raising system provides convenient operation from the tractor seat. In the transport position, the rotors can be rotated inwards to ensure safe transport and space-saving parking. Warning signs and road lights are standard. 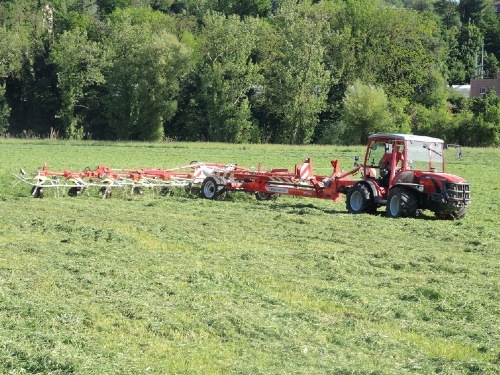 The tedder series for farmers who place value on high performance, top-of-the-range equipment and convenient operation. Working widths of (DIN) 5.75 m / 6.45 m / 7.45 m offer high outputs. The small rotor diameter of 1.30 m guarantees exceptional ground tracking, perfect forage pick up and a more uniform distribution pattern. HIT tedders are especially noticeable for their short headstock. Consequently, the centre of gravity is moved closer to the tractor. The heart-shaped pivot pin brings the machine into the centre position when it is raised. The vertical point of rotation reliably prevents under-running when working downhill. 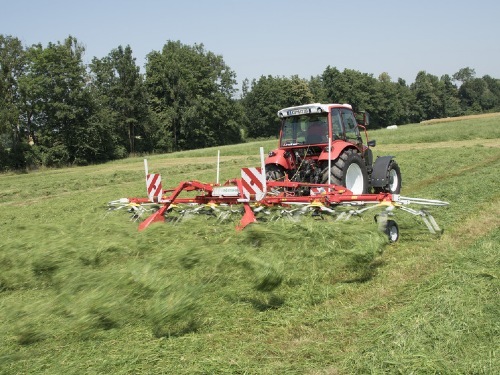 A slotted hole enables operation with a MULTITAST wheel and rigid top linkage. The transport interlock enhances safety on the road. A practical PTO shaft holder and hose tidy makes coupling and uncoupling a great deal easier. The double-acting stabiliser struts on both sides ensure the machine is always centred. That is especially important on slopes. Even at high working speeds, these struts guarantee that the machine runs smoothly. For road transport, the HIT features additional stabilisers. 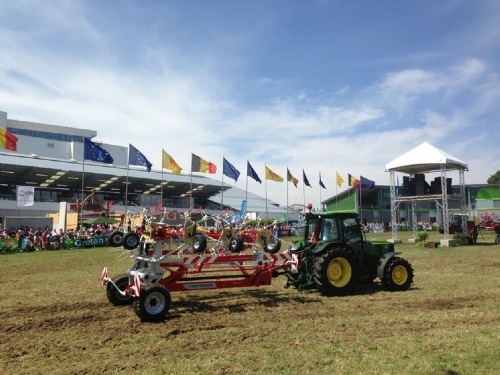 In the transport position, the raised rotors are tilted very close to the tractor. This favourable centre of gravity means improved safety while driving. The double constant velocity joints in the driveline allow the rotors to turn in any position, eliminating the possibility of operator errors. Warning signs and road lights are standard. The optional LIFTMATIC valve on the headstock locks the outer rotors when raised at the headland. This guarantees high ground clearance. 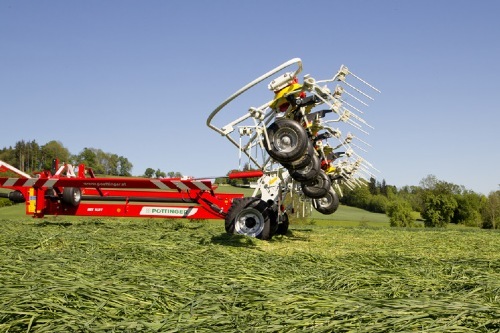 For tractors with low a three-point lifting height, the optional HYDROLIFT system raises the outer rotors during headland turns. This produces sufficient ground clearance for the rotors. We meet the highest specifications in the professional sector with these eight rotor machines. You will be impressed by how convenient they are to operate. 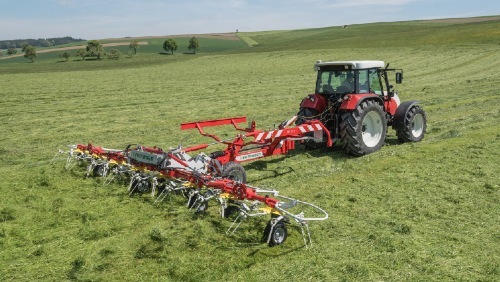 The ideal tedder for your mower with a working width of 3 m.
Working widths of (DIN) 7.70 m / 8.60 m offer high outputs. 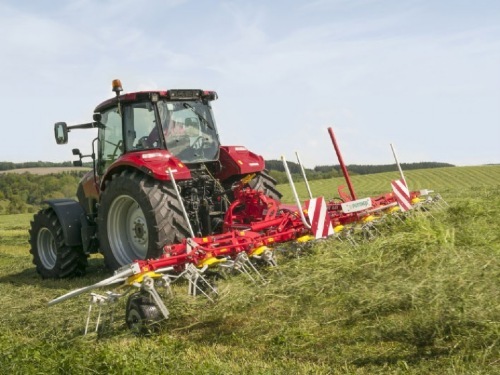 The small rotor diameter of 1.30 m on the HIT 8.81 guarantees exceptional ground tracking, perfect forage pick up and a uniform distribution pattern. The heart-shaped pivot pin ensures the machine is in the centre position when it is raised. A practical PTO shaft holder and hose tidy makes coupling and uncoupling a great deal easier. A power coupling can pivot the outer rotors on the eight rotor tedders through 180° for transport. Parkable in the transport position. The parking height is just 2.87 m / 3.26 m, so these tedders easily fit into the machinery barn. 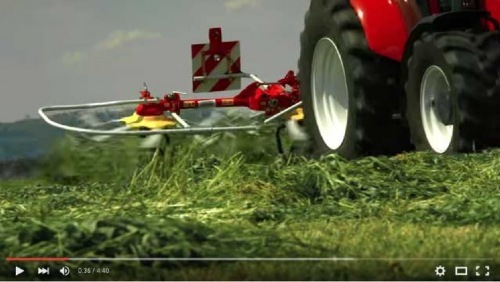 For tractors with low a three-point lifting height, the HYDROLIFT system raises the outer rotors during headland turns. This produces sufficient ground clearance for the rotors.